November 12, 2018 update: This is an older post which we will update shortly, but we no longer work with Divi! We really only utilized it on very small website projects anyway – but we have found that our clients that were using it were finding it way too difficult to learn. The learning curve is very large and Divi has added so much to the interface, it actually is almost confusing now! Even when we built the pages – the client would still get confused and break the layout, so we no longer work with the platform and only do custom coded websites. Divi used to be our go to option for clients that may have had a smaller budget and for a lot of our smaller non-profits as it takes custom coding out of the cost equation which offers a more affordable – yet custom option. The LOOK of Divi can be made to accommodate any look and feel you can dream up— we just utilize the core code and then customize the design and functionality to give our clients an affordable website that has everything they need and a look they want. So what are some of the best features of Divi? Control font color, size, add icons and so much more from content blocks. Endless design options – you are only limited by your imagination! Reliable developer – we have been using Elegant Themes (makers of Divi) since 2009! OK, so what is the bad stuff – there has to be some! Some have reported an issue with load time because of the extra code Divi comes with – but if proper precautions are taken this should not be too much of an issue. It has “too many” options! Although we stopped working with it – for the few clients that we have that do utilize it that we maintain – we have seen the latest updates have so many options that my clients are now confused. Paddings. margins, videos, images – all these settings are great, but for novice users it can be overwhelming. *Divi recently released their Divi Module as a plugin that can be used on ANY THEME. So the shortcode issue in some way has been address! 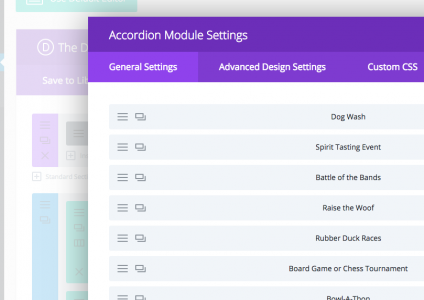 Once you use the Divi Module editor — you won’t want to live without it anyway! So, can I just do this myself – why do I need you? You don’t “need” us so to speak, but there is still a learning curve – and design and other integrations you may need help with. It is still a theme and needs setting up and has unique features that may be confusing. Also, if you have a specific design in mind – it may take you a while to figure out how to transpose that look and feel to the theme. We also have a developers license so you would not have to pay for the theme or updates. So, if you are a do it yourself-er who loves the challenge – then GO FOR it! We would love to see what you can do! 2 Dogs Design typically does NOT use themes in our web design projects – we work primarily on the Genesis Framework for our custom clients since we find it easy to use, incredibly well coded and loads very fast – but we will use Divi for our clients looking for something more affordable and easy to self manage. We have recently learned about the Make theme by ThemeFoundry and that looks like a promising option also, so that is another one we may consider in the future. So what will a Divi website cost me? One of the reasons we offer Divi is to help smaller business get a professional website at a rate that is more affordable. Most of our clients who decide to go with Divi range from $3,000-$5,000. If you use 2 Dogs Design for your website there will be no charge for the Divi theme as we have a developers license. Please note that these are just ranges and are subject to change based on the exact needs and functionality you require! If you are interested in a consultation, please feel free to call us at 732.241.5365 or contact us through our website!